Welcome to the Ph.D. program in economics at the University of Kansas! The Ph.D. program serves advanced students of economics with a focus on research. We seek dedicated students, train them in theory and practice of economics, and help guide and support them toward their dissertation research and placement. Our program has several notable features. View our flyer (pdf). Comprehensive structure. The PhD program provides a solid foundation in modern economic analysis, develops expertise in two specializations, facilitates dissertation research, and supports graduate student professional development and placement. We have a long-standing tradition of producing Ph.D. economists with strong foundational skills and expertise. There are annual milestones and incentives to help students finish in 5 years. This includes dedicated faculty advising every semester and early pairing with research faculty. Read more about program requirements. Full funding. We provide a five-year financial support package for strong students. This typically includes a full tuition waiver, a paid graduate teaching assistant position, funding for conference travel, and more. Read more about admissions. Abundant research possibilities. Faculty work in many fields, including behavioral economics, development, econometrics, economic theory, environmental economics, experimental economics, financial economics, game theory, growth, health economics, industrial organization, international finance, labor, macroeconomics, mathematical economics, microeconomics, monetary theory and policy, and more. Read more about faculty. Dedicated placement support. A placement team committed to support job market activities, including portfolio development, job talk coaching, and faculty outreach. We regularly place all PhD students in their areas before graduation. Read more about placement information. Exceptional quality of life. 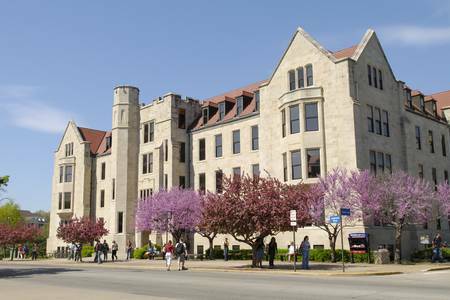 The KU campus and Lawrence community provide a vibrant downtown adjoining campus, a low cost-of-living, and many diverse opportunities for entertainment and recreation. Be a part of the proud Jayhawk tradition! Read more about student life.